The Schoolhouse Rock Page For Teachers! Hello and Welcome to Teaching is a Work of Heart's School House Rock Page. As you know, the Schoolhouse Rock series has been used as a learning tool with students since the late 70s. The anniversary DVD marks the first time that all of the songs have been available in one collection. I have personally used the Parts of Speech VHS many times in my classroom. The students really love "Unpack Your Adjectives" and "A Noun is a Person, Place, or Thing". I love them too. It is amazing how quickly students grasp the parts of speech after watching these videos a few times. I have also used some of the multiplication songs to teach some of the tables. The history rock video has also been used in my classroom. We all are familiar with "I'm just a Bill". The School House Rock collection has made my lessons exciting and entertaining... I don't think I could teach the parts of speech without them. Tee-hee! When I first got the the DVD I was so thrilled with it. It would be so easy to use in a classroom - no more rewinding or fast forwarding to get to "A Noun is a Person, Place, or Thing" Plus it is such a joy to have ALL the videos in one place! Now only if the schools I have taught in would get DVD players. I am sure most classrooms will have them soon! Anyway, this page is dedicated to teachers who use the Schoolhouse Rock Series in their lessons. We hope you will find a new idea or resource on this page. Enjoy the lessons, links, and products! Happy Teaching! All the songs and videos in one place! 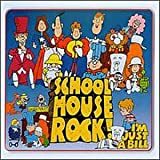 Other School House Rock Products - Click to learn more! Great Ideas From Great Teachers! There are many ways to use these songs in your lessons. Below teachers will share the way they use them in their classrooms. We asked teachers to tell us how they use the songs and videos in their lessons. Below you will see all the ideas teachers gave. We then choose our 7 favorites. The names of the 7 favorites were entered in a drawing to win a The Best of Schoolhouse Rock! - 30th Anniversary Edition DVD. The Top 7 Lessons Were Enetered in the drawing. The two lessons with the schoolhouse graphic Won a Free DVD from Teaching is a Work of Heart. Congratulations to Maura Timmerman and Kathy Lee ! When teaching adjectives - make a vest or sweater, skirt, and hat into a lesson for adjectives. After watching (or before) the video (UNPACK YOUR ADJECTIVES) and going over what adjectives are - walk in dressed in this crazy outfit. Have many things attached- like spoons, cds, etc. the possibilities are endless! Be colorful, and the crazier the better. Have the students not speak - and write down everything they see - noun and an adjective to describe it. )ex - silver spoon, round cd. The kids love it! One way that I could use this song is when I teach about interjections. We could start the lesson by listening to (and singing along with), the video, then brainstorm a list of interjections of our own. Then, I write all the interjections on word index cards and put inside a bag decorated with exclamation points! Each student would then come up to the front of the room, draw and interjection from the bag, and demonstrate for us what that interjection would look and sound like. As an extention to this activity, I would have the students use the interjections in a creative writing exercise. Students would work in groups of 2 and choose 1 interjection from our brainstorm list. They would then write a scenario of when that interjection would most likely be used (ie, OUCH! The scenario would be about a visit to the doctor's office for an annual check up and shots.) I would have the students then act out their play, using the interjection. To make it more of an audience participation activity, the students could design interjection signs (on larger poster board) and hold up the sign with the interjection whenever they want the audience to INTERJECT! Since I teach music, I use just about all of the songs-we sing them, dance them, and act them out. We've also done some of them on stage, complete with limited props and costumes. Not quite "Schoolhouse Rock Live", but a wonderful way to reinforce the concepts. Parents also really enjoy this. I will often assign each group of 4-5 students a single song, and let them choose the best way to dramatize it. One of my favorites to act out is "Conjuntion Junction"-I make train cars (from posterboard) with different words appropriate for linking, and the kids are different conjunctions. We come up with some extremely long run-on sentences, but they definitely get the parts of speech down. Lolly, Lolly, Lolly get your adverbs here is another fun one-we make an "assembly line and pass words down the line. The inspector has to sort which words are verbs, and which are adverbs. This is all complete with different factory sounds (I don't dictate the sounds-the kids do a better job than I do). And I don't think I've yet had a child who didn't love yelling out interjections with the song. We have acted out this one with differnet hats (the kids especially love the football player going the wrong way) and props, with large signs for the different words. A memory, although not a lesson idea: My younger brother was a 2 time National Citizen Bee finalist. This competition takes only the top 2 history/political science high school students in each state to the national finalist, where there are both written and oral rounds. One year, one of the questions on finals (the top 10 students in the country) was on the preamble to the constitution. You could tell when each student in the room reached that question, because you could hear, hummed really softly..."We the people, in order to form a more perfect union..." So SchoolHouse Rock isn't limited to the little ones! This is a great song to review even numbers and counting by 2's as well as an introduction to multiplying by 2's. I would use this song when we learned about even and odd numbers. We would sing this song as a class as a review for multiplying by 2's. I would also divide the class into groups and have part of the class sing the problem and the other part sing the answer and then students would switch sides. This song has a terrific jingle that would impact the learning of the 2's by all students. I would also use it as a reminder to have students check their work before leaving the board or completing problems that all answers were even when multiplying by 2. To reinforce the Thanksgiving story, view No More King. This will help visualize the conflicts the Seperatists may have gone through before leaving England to go to Holland and then to America. Students will learn and memorize the Preamble by singing along with the tape. I use the nouns song and after we listen to it each child gets 3 of 1/2 of a regular sized index card to draw a person, a place, and a thing or animal. Once they are drawn I collect them all in a basket and we sort the pictures into the categories of people place and thing. Then we put the people in one container, the places in another, and the thing/animals in another. Each child draw out one card from each category and has to use the three nouns in a sentence. Some of them get quite silly. This is fun to do at holiday times such as Halloween, Thanksgiving, and Christmas. Some sentences are typical such as The cat rode a broomstick over the graveyard. Others are fun such as One witch went to the White House on the back of a camel. We keep these sentences and when we get to adjectives we try to add a describing word for each noun. Another take off from this is to have copies made of each sentence and then pass them out randomly to see if someone else can find the nouns in the sentence. Another take off I have used is to have children trade papers and illustrate someone else's sentence. School House Rocks Song used in your lesson: "Unpack Your Adjectives"
Lesson: Listen to the song (watch the video). Have a quick discussion on how adjectives are used. Have the students brainstorm on some adjectives that they could use. Write them down on the slips of paper. Put the slips of paper into the suitcases. Have students come up and take the slips out of the suitcases. Using the adjective they drew, have them write creative sentences. Repeat this as many times as desired. After they write their sentences have them share (in groups, to the whole class, etc.) what they came up with. A big thanks to the many other teachers who handed ideas in. All the ideas were wonderful. Still, we could only pick two. We wish we had more than 2 DVD's to give away. I am sure many will use your ideas! Thanks for sharing! This year we did a unit on the U.S. Constitution. As we discussed it I talked about how when I was in High School I memorized the Preamble. When asked if I could still remember it, I started singing the Schoolhouse Rock version! The kids loved it... so, I found a VHS to borrow and we integrated it into our days activities. Each day we would listen to the preamble song and before long my third graders could almost do it by memory! They learned alot from the video and when we have a moment to spare they always ask to watch the "preamble video".... :) I would encourage teachers to use these songs and videos when ever they can because the visual and lyrical aspects really stick with students of this age. Currently I teach four levels of ESL English to 74 students. As a past K-8 music teacher, I, of course, love to incorporate raps and songs in my teaching. At first they are a bit surprised when I break into song and bop around infront of them, but soon they are chanting or rapping along with me. Students will sing and memorize a segment of the song. To learn to count by threes we first watch the video a couple of times. My visual learners will pick up on the counting part quickly. Through the year, in math, we will continue to sing "3-6-9, 12-15-18, 21-24-27, 30" and add 33, 36 in chant. This in turn helps us learn our 3 multiplication table. Students learn parts of speech through chants from Shurley Method. Once each student is familiar with these and labeling sentences, they will view the video numerous times throughout the year to give them a better understanding of the use of each part of speech. Again, visual learners will benifit from this. School House Rocks Song used in your lesson: "Conjunction Junction"
I teach "conjunctions" to my sixth graders. We do a few lessons involving conjunctions, listen to the song continually, then the sixth graders perform a skit to the song for the 3-5th graders. They have a lot of fun. My students are amazed when I play the song for the first time and I know all the words... they don't realize that I grew up with "Schoolhouse Rock." I still to this day can recite the preamble thanks to "School House Rock"! The video on how a bill becomes a law, could be used to reinforce a lesson on policy-making. I would use this song as an extension of a math lesson. All students will receive a package of Brach's DEM BONES candy to graph. As a class we will compare results and listen to the song to identify the bones in the song with the candy bones as well as on our body. It will be a great background song to play during this lesson to set the mood and get everyone excited. We also do an art lesson and make a skeleton from Q-tips or pasta on black construction paper. This song will allow the students to identify the bones using scientific names! Hear all the songs here!